Way out in the East Bay, hidden in thick trees and brush, there’s a portal to another world. It’s down below the streets in a creek bed, where the mouth of a storm sewer opens up like a cavern. Inside, crawdads scuttle in ankle-deep pools, and ominous booming sounds echo throughout the vaulted interior. A menagerie of fantastic paintings cover almost every inch of wall inside the half-mile tunnel that runs underground. Scott Finsthwait, the unofficial curator of the constantly evolving exhibit, walks the subterranean gallery regularly. “This place is like a museum to me,” said the 45-year-old Finsthwait, an artist and photographer based in San Francisco, who is on a trek for the best street art. 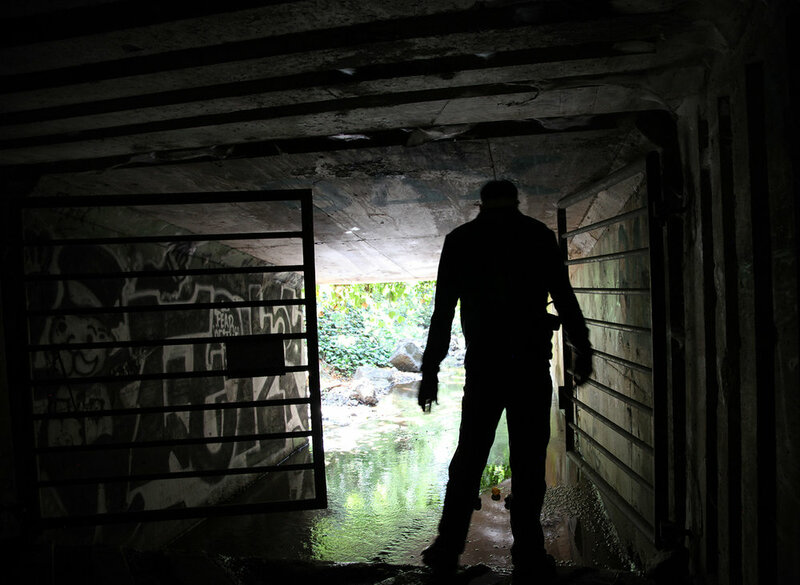 He declines to give up the exact location as the artists prefer that these tunnels remain a secret to the general public, to help ensure that their work is not painted over. “This is sacred ground for street artists,” he said. Increasingly, Finsthwait said as he walked along the tunnel, the best street art is found in out-of-the-way places like Orinda or Fairfax. His self-appointed role has been to find the best work and share it with the world in exhibits such as the one displayed in September at City Art Gallery at 828 Valencia St. His photos there featured street art pieces surrounded by fantastic streaks of light, like neon apparitions. The tunnel Finsthwait is exploring on this Monday afternoon is pitch black. He turns on a flashlight and casts it across the paintings in the tunnel to see what has changed. “There’s a nice piece under there, but this shithead covered it up!” he says. Finsthwait is referring to a new addition that’s covering one of his favorite works, a painting by an artist known as Eugor. The offending artist, known as Spree, painted a throw-up – a very large, ornate rendering of the artist’s tag or signature. Now lost is what Finsthwait describes as a piece – a masterpiece, an elaborate mural. To Finsthwait the tags and throw-ups are mainly about communication and territory, he’s not at all interested in throw-ups, and Spree’s recent addition leaves Finsthwait livid. Nite Owl’s work appears in the tunnels where Finsthwait is shooting. From his small studio in Oakland, Nite Owl, a former architect-turned street-artist, ekes out a living selling art directly to clients. He says it took him about 10 years to build his local reputation and develop a client base. Like Nite Owl, Finsthwait’s path to street art was circuitous. There was no street art photography course at Kenyon College in Ohio where Finsthwait studied English. He wasn’t even interested in photography until found himself admiring post cards in Greece. He became obsessed with figuring out where they were shot and re-creating the photos. This obsession led him to a course at the Rocky Mountain School of Photography which changed his trajectory completely. About half-way down the tunnel, Finsthwait finds the piece that he wants to photograph. It was another Eugor, depicting a seated man, three cloaked figures and numerous floating heads. He runs his hands over the piece, appreciating the texture. It is clear looking at the piece that the quality of street art that no photographer can capture is the texture. Seeing a piece in person is a bit like seeing a Van Gogh in a museum and realizing that a two dimensional photo can’t capture the layering or the brush strokes. Eugor’s crisp clean lines display a mastery of spray paint. The figures are accentuated with thick blocky brushstrokes. Drips of paint run down the piece like tears. Finsthwait sets up his camera and gets to work. He uses a wide-angle lens and sets his camera to take a very long exposure – 30 seconds – and then runs through the frame painting the walls with different colored flashlights. The light slowly builds up on the camera sensor, gradually revealing the room, burning streaks of light into the photo. It is a process that gives Finsthwait’s finished photos the impression of a space lit with many powerful studio lights. In fact, when Finsthwait takes a photo in a tunnel, it’s almost completely dark. Finsthwait was all business as he shot the Eugor, using a yellow light to complement the blue in the piece. Finsthwait wants to collaborate with street artists. This is why he’s always so careful to respect spaces like the tunnel by never publicly revealing the location. Since 2004, when San Francisco passed a graffiti removal ordinance requiring property owners to remove graffiti promptly or pay steep fines, spontaneous street art has been vigorously targeted for removal by the city. Only planned murals, with content approved by property owners or the San Francisco Arts Commission, are safe from destruction. Non-approved pieces are considered graffiti and vandalism. And for street artists like Nite Owl, controversy is the whole point. But local powers don’t much care what happens in hidden spaces like the tunnels, so artists like Nite Owl aren’t rushed when they paint there. This is what makes the tunnels so special. Nite Owl recently started collaborating with Finsthwait. He air-brushed a design onto one of Finsthwait’s prints, which was the featured piece in the exhibit at City Art. But for Finsthwait, the street art is a side-effect of his main obsession. He sees himself as an urban explorer. He loves witnessing dereliction, and finding places that have been abandoned. The pieces hidden deep inside tunnels are the treasures he finds after a long arduous journey. The harsh afternoon light surprises Finsthwait as he exits the tunnels and walks back into the open air. As he climbs back up to street level, to the land of the local powers, he mentions his main concern with his work. “I love street art in these tunnels, or abandoned buildings. I don’t like it when graffiti artists deface public property or private property, and it’s constant quandary, because a lot of these guys do.” he says.